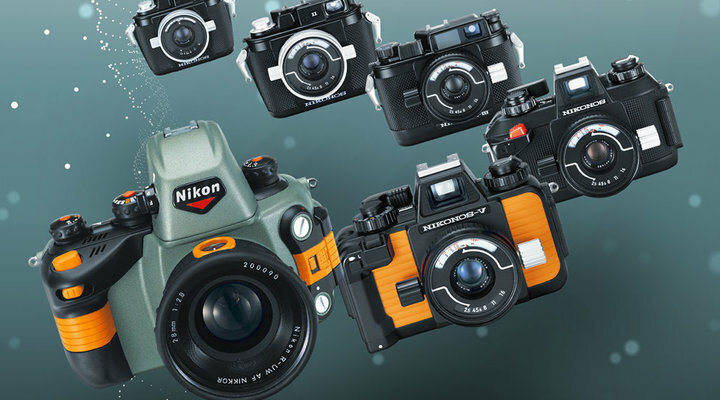 The introduction of the Nikon 1 AW1 will surely bring to mind among Nikon fans a camera from the company's legendary lineage: Nikonos, a camera that for over 30 years was synonymous with underwater photography. The Nikonos owed its creation in large measure to underwater explorer, adventurer and conservationist Jacques Cousteau, who in 1950 founded the French Oceanographic Campaigns and outfitted a ship named Calypso for research, diving and documentation. In 1956, an underwater camera was designed for Cousteau by Belgian engineer Jean De Wouters. It was called the Calypsophot. Nikon brought its technical expertise to the camera's design, and the Nikonos 1 became available in 1963. Gradual improvements marked Nikonos models II and III, but the Nikonos IVa, introduced in 1980, was the first model to vary the Calypso design. The IVa featured aperture-priority exposure, auto exposure lock and an electronic shutter. An automatic Speedlight, the SB-101, was also introduced. Four years later the Nikonos V debuted, offering manual shutter speeds and auto TTL flash with underwater SB-102 and SB-103 Speedlights. In 1992, the last Nikonos, the RF AF, was developed. The first underwater autofocus SLR, It offered four interchangeable lenses—a 13mm fisheye, a 28mm wide-angle, a 50mm micro and the first underwater zoom, a 20-35mm. The evolving technology of underwater housings for SLR cameras was one of the reasons Nikon discontinued the sale of the Nikonos in 2001. Now, for the photo enthusiast looking to explore, document and have fun to a depth of 49 feet, a whole new era begins with the Nikon 1 AW1.